Each person will be giving and receiving crystal healings as the foundation of the course is experiential. Education in the theory and practice of the ancient art of the Laying On of Stones will be the focus as well as the specific healing qualities of many crystals and stones. Attunement and meditation practices will be taught to accelerate intuitive development. Crystal Healing is a healing modality that works directly with the light, color, beauty and perfect geometric forms that the mineral kingdom provides to assist us in balancing all aspects of our being. 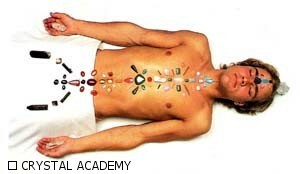 It is an advanced healing art that has the capacity to influence the physical, mental, emotional and spiritual bodies. Specific stones are placed upon the chakras, or spiritual energy centers, of the body. Since each one of the chakras has an associated color, generally speaking the crystals or stones reflecting that specific color would be placed upon these physical nerve plexus points. Familiarity with Vol. I and Vol. II of the CRYSTAL TRILOGY is a pre-requisite. Priyen Patrizia Tassini is the only Crystal Academy’s Italian teacher since 1995. Informative handouts are included.Crystal Academy Certification will be offered after each Course upon successful completion. The Course will be held in Corralejo,Fuerteventura.Time schedule: 10:00 a.m.-05:30 p.m.